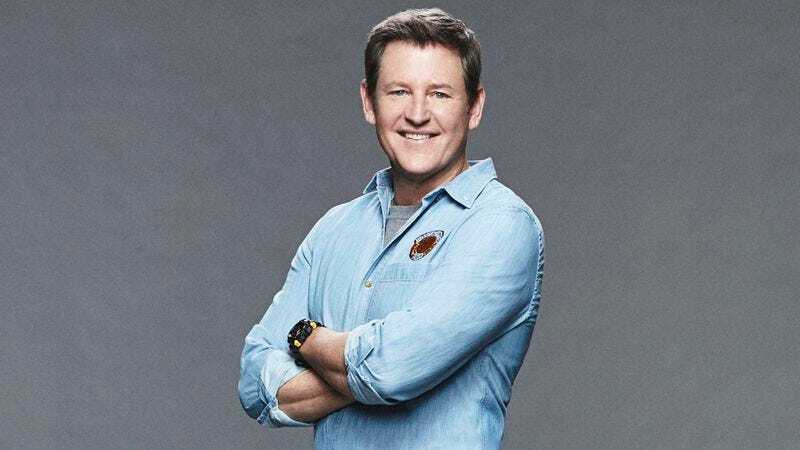 Denim and khaki clad guide Kirk Fogg will return to Nickelodeon’s Hidden Temple: The original host of Legends Of The Hidden Temple will return for this fall’s TV movie adaptation of the game show, once again calling upon the powers of Olmec to help him guide a bunch of wily kids through the shrine of the silver monkey. In the new movie, three siblings—played by Isabela Moner, Colin Critchley, and Jet Jurgensmeyer—get into a little bit of trouble when they go off book during a temple tour run by Fogg. And while a bunch of the show’s old trappings will be back—including the aforementioned Olmec, as well as the Steps Of Knowledge, the iconic entrance to the temple, and representations of the show’s colorful, animal-centric teams—things are a bit different this time around, and not just because Legends is no longer a game show. Fogg says he first visited the set about three weeks ago, describing the scene as “Raiders Of The Lost Ark meets Jumanji.” (Editor’s note: The A.V. Club has visited the set, and he’s not wrong. More on that at a later date.) He also said the movie’s creators were especially interested in showing him the new temple’s various rooms, though what those will be—and how much the movie will draw from the original show—is still under lock and key. Still, Fogg promises fans of the ’90s classic will find much to like about the new movie, regardless of whether they have kids of their own to watch it with. Legends Of The Hidden Temple, the movie, will air sometime this fall on Nickelodeon. Legends Of The Hidden Temple, the game show, still airs occasionally on The Splat.